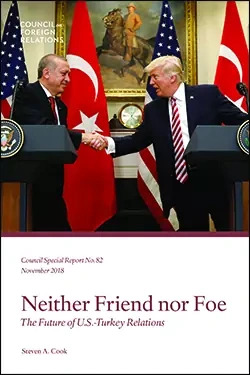 “While Turkey remains formally a NATO ally, it is not a partner of the United States,” writes Steven A. Cook in the Council Special Report Neither Friend nor Foe: The Future of U.S.-Turkey Relations. “Unlike in previous eras, Washington and Ankara no longer share overarching threats or interests that bind them together,” Cook notes. “[President Recep Tayyip] Erdogan’s consolidation of power and corresponding suppression of journalists, academics, civil society organizations, and minorities” contradicts the underlying principles of American society and Turkey’s own North Atlantic Treaty Organization (NATO) membership, Cook writes. Diverging policies and perspectives—such as Turkey’s incursion into northern Syria, its intention to purchase an advanced air defense system from Russia, and the arrest of more than a dozen Americans and three Turks employed by the U.S. embassy—have further widened the chasm between the United States and Turkey. Cook, the Eni Enrico Mattei senior fellow for Middle East and Africa studies at the Council on Foreign Relations, also details Turkey’s own list of grievances against the United States, including tariffs on Turkish steel and aluminum after an agreement on the release of Pastor Andrew Brunson fell through in the summer of 2018; U.S. military coordination with the People’s Protection Units (YPG), which the Turkish government claims is part of the Kurdistan Workers’ Party (PKK), long designated as a terrorist group by the United States; and the refusal of the United States to extradite Fethullah Gulen, whom Ankara blames for the failed July 2016 coup d’état that killed 249 people. Reject Turkey’s demands that the United States end its military ties with the YPG. The YPG has been “an effective force fighting the Islamic State and stabilizing northeastern Syria.” For the United States to turn its back on the YPG would give Washington a reputation as an unreliable ally. “Legislators on both sides of the aisle [in the United States] have an opportunity to make Turks aware of Washington’s anger at Ankara’s mistreatment of Americans, its displeasure over a foreign policy at variance with U.S. interests and goals, and its dismay over Turkey’s transformation into an elected autocracy,” writes Cook. “Washington can work with Ankara where it remains possible, work around the Turks where it is necessary, and work against them where it has to,” the author concludes. Bookstores: To order bulk copies, please contact Ingram. Visit https://ipage.ingrambook.com, call 800.234.6737, or email orders@ingrambook.com. Include ISBN: 978-0-87609-739-7.